This is a simple snippet that will allow you to download a file from the internet in C# while being able to display the download percentage, download speed and the amount of total data received while downloading. First we need to import three new namespaces in addition to the ones we already have. Then we add the two following global variables. Then finally we have our main methods that will do all the handling and displaying of the information. // Calculate download speed and output it to labelSpeed. // Update the progressbar percentage only when the value is not the same. // Show the percentage on our label. That’s pretty much it. You just need call the DownloadFile method with the URL address you want to download the file from and the place you want to save it to as arguments. 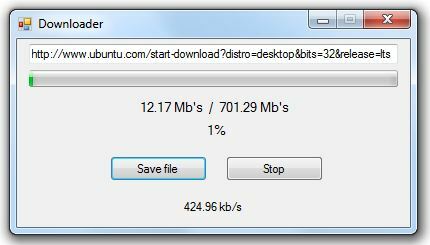 The above snippet uses labels to show the information (download speed, percentage, number of kilobytes downloaded) but feel free to modify the snippet to suit your needs. and then i entered webClient.CancelAsync(); inside the method but its not working. This is a good program, easy & short. How I can calculated the aprox time to finish the download? It just says complete when i press button1, no labels update and it doesnt download anything any ideas? Does it need to be ran as admin? The download path needs to have the filename and extension included if you dont specify the filname and extension in the location path it wont download. Hi, thank You for sharing Your code. Everything works fine, as expected. When I click Save file first time everything works fine, but after second click I only get file name, download isn’t starting. Without that code I’m able to download file multiple times – I click button, get message box, click button and so on. With above code when I click button second time (after first download finish) nothing happens. Could You please help me solve that? Ahhh Im dumb and figured it out! now I do have another question. Lets say I want to download 3 files at once using one button. How would I got about doing this that after one finishes the next starts! I do appreciate it! What was the simple mistake Chris? how to show percentage with decimals? How to add the link for the download file ? I used ur code and it works fine in the “real World”. But what i need to insert, if i must use a proxy? If i try to use it “as is” i get a 401-Error from the (Proxy?)Server. Its a company-wide rule, and i can not see the settings, i do not need any User or PW, just using the system settings for the Proxy. I do not have a adress/port for the proxy. The Proxy in the company is automaticly configures by a script that the normal user can not touch. what would the example therefor look like, please? The code you mentioned is actually correct. WebRequest.GetSystemWebProxy will give you the system’s proxy server, which is what is under Control Panel -> Internet Options -> Connections -> Lan Settings. If the company’s script uses another method to enforce the proxy (not using the system’s proxy settings) then this will not work. OK, seems to be a Problem with httpS-Connections. If i try to reach http-Server it works. Thank Thee. please add pause/resume support for this project…. Ok. I have gotten the code and its working mostly… When you goto download the file it makes not attempt to download it. It just says that the file has been downloaded. All the Lables and Buttons (also the loading bar) are named correct and Im getting no errors. Its just not downloading. Any Ideas? I got Message “Download completed!” instantly without downloading or error. i’m disconnect from internet and call DownloadFile method! app show massage(“Download Complete!”) and a file with 0KB created(string location)!!! how to resolve this problem and show error when the connection don’t exist? which arguments i do enter in webClient.CancelAsync();???? If I want to Download a file to the applications executing directory with a set URL to download the file. Give the project file ? The Visual Studio Project File (Project of Visual Studio) to download. i am stuck on how to exactly pause and resume the download, do i cancel it first and then recall download passing the header with the bytes to continue? when i do that it just goes straight to ‘download complete’. i have a variable that holds the current bytes received, and i do pass it to the header. what am i missing here? I am using above code but my downloaded file is of 0 Kb in size. I have called File Download Method firstly on form_load and after that on Button Click. I am trying to download an file which is of 6 mb in size and its extension is .EXE . How multiple files to download ? this saved my time also..
How to download a file from an protected folder with username and password? Oh I’ve fixed it. I forgot sw.Start (). thanks! I’m trying to figure out how to use the CancelAsync() method. I look at a few MSDN articles, but I’m new to programming. Can you please give me an example to follow. What do you put in to stop the download? To cancel the async operation of a WebClient object you will need to use its CancelAsync() method. I have another question.How can I Back the download complete bool flag to main thread ? Depends what you want to do exactly. If you simply want to announce to the user that the download has been completed when the downloading is taking place in another thread you will need to invoke that control. what about resuming the download..? You will need to add and specify the range header. Change 200 with the value you would want to continue from. Hey, at beginning sorry for my English. I get Message “Download completed!” instantly without downloading or error. You need to specify the offset. As an example, the above code will skip the first 200 bytes. The idea is to monitor how much bytes have been downloaded in order to know how many bytes to skip when you are resuming the download. But even when i add correct value I get Message “Download completed!” instantly. Something is missing. of writing posted at this web site is really good. I have one c# based application. what i want to do is display the csv files present in the folder in a list and facilitate the user to download the specific file to the local pc when one user clicks on the link. I was looking for something like this for a while now. Thanks for sharing !